It’s 1914 and the call is going out for all brave young men to sign up to take part in the war to end all wars. Jim and his friend Charlie abandon their work in the Australian outback, keen to use their horsemanship skills in the exciting adventure of the battle. Their enthusiasm carries them through training and travel overseas, but as they join the Light Horse they quickly discover that war is far from a fun adventure. They face the brutal realities and hardship of life on the battlefield and know that their lives will never be the same again. A combination of narrative and letters as well as original photos and images of primary source documents, Light Horse Boy is a detailed account of the experiences of members of the legendary Light Horse Brigade. Despite the wealth of references and details, Light Horse Boy is far from a dry historical account. The letters between Jim and his sister and Jim's reflections on his experiences create a very emotive and personal account of the battlefront. The inclusion of details about the care and experiences of the horses in the Light Horse add an additional emotional element to the tale, as do the beautiful charcoal sketches by Brian Simmonds used to illustrate various scenes. I was drawn into the story from the first pages, as Jim and Charlie decide to enlist. ‘We could both join up. Wouldn’t that be a lark’, Charlie suggests to Jim and they rush to visit the recruitment tent, worried that they will miss out on the adventure if they delay. Their youthful exuberance and naiveté is heartbreaking for those readers who understand what is ahead. Light Horse Boy offers multiple perspectives on the impact of the First World War – from the battlefront to the hopes and fears of family remaining at home. It contrasts the impersonal nature of the strategy decisions made by military commanders with the very personal impact of the battlefield on the hearts, minds and bodies of those on the frontline. 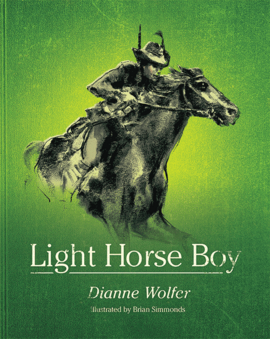 Beautifully written and meticulously researched by Dianne Wolfer, Light Horse Boy is a companion story to Lighthouse Girl. It has been included on the CBCA Young Readers Book of the Year Award Notables for 2014. I highly recommend Light Horse Boy and Lighthouse Girl as excellent primary school classroom resources for students interested in this period of Australian and world history as well as very accessible and meaningful introductions to these important historical events for children to have access to at home. There are teaching notes available here.